For many people, the AR-15 is the gun of choice. One of its biggest draws is that it offers an easy to modify platform. For shooters, the gun becomes easy to adapt from one purpose to another. Those options include hunting, target practice, home and self-defense. Another draw, these guns are easy to build even for novice gunsmiths. That little fact causes a lot of interest in these guns. By building it yourself, you can do so for less money. Allowing you to customize it to fit your shooting needs or build more than one. Still, the question remains — How easy are these guns to build from scratch? The answer is a little more complex but in the general sense, they are easy to build. What Do You Need to Build an AR-15 at Home? Almost all the parts needed to build an AR-15 are available online. The most scrutinized piece of the AR-15 is the lower receiver. In fact, it is the only part of the unit that federal and state laws actually consider the weapon. This is also the most cumbersome part to get. You will need both a lower and upper receiver and a parts kit for each. You will need a buffer, buffer tube, and a buffer spring for the extension on the lower receiver. 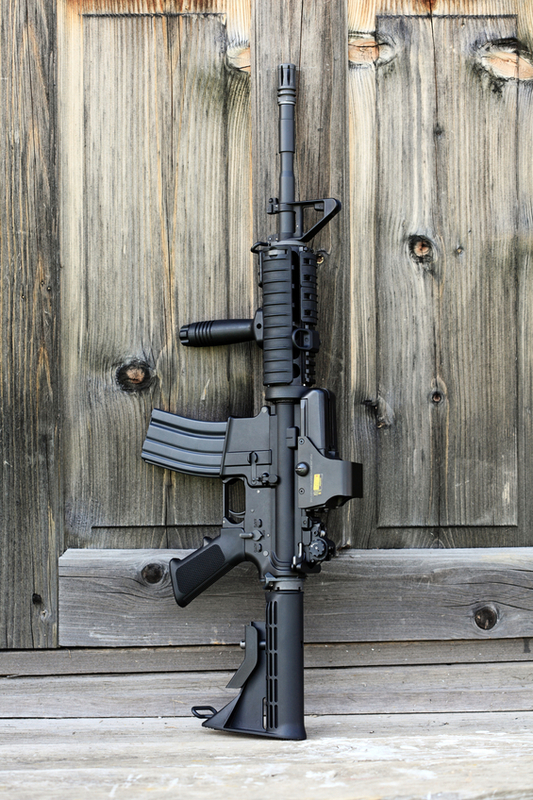 You will need a Barrel and gas block system – Most opt for a carbine length gas system. You will need handguards – It is a good idea to match them to the gas block system. They are available in different lengths – carbine, mid-length, or rifle. You will need a firing pin kit or bolt carrier group. These consist of a carrier, bolt, firing pin, cam, extractor, ejector and spring. You will need to finish off the gun with a Buttstock. These come either as a collapsible unit or fixed. Ensure that you meet federal and state laws in regards to building a pistol or rifle and the appropriate parts to meet the definitions. Literally, the difficult part is the lower receiver. You can get a lower receiver at a gun dealer, gunsmith, from an online seller. You will have to find a gunsmith or gun dealer to act as an intermediate for an online sale. Once that happens they will resell the unit to you when it arrives. The key to building an AR-15 is being specific about its use. The parts for the hunting version differ from those for the unit used in home defense. Save all that wasted money on parts you don’t need by being specific about what you want this gun to do. You have a lot of options when you buy parts. You can buy pre-assembled receivers. These allow you to simply put the pieces together to form the gun. You can buy the pieces one at a time and assemble everything yourself. Start by asking yourself what you want to gain from this experience. There is also no shame in bending the ear of a gunsmith if you need a little help. You will need the basic understanding of what each part does, its name, and a little ambition. There are about 130 parts, including accessories like flashlights and scopes, that go into a completed AR-15. You will also need some basic tools, a clean work area, and a place where you can assemble small parts. A clean, flat workspace that you won’t mind if it gets greasy. A metal covered table works well. The bright metal helps you see the parts and it can take a beating. A rifle mount stand makes the assembly process much easier. Some folks just use a vice, but there is that old saying about using the right tool for the right job. Good lighting. The parts are small and intricate. Lubrication rated for gun use. Headspace gauges and a torque wrench are a must to meet proper specifications. There are a few things that you need to do before you load the gun. Check that the safety works through all settings. Check that the trigger works. Slowly pull the trigger and listen for the internal parts. Load a round and fire it. Recheck the gun for loose parts or damage. Disassemble, clean and inspect after the first several rounds. You want to look for unusual wear. Expect to take a few weeks to put together your gun. You want to go slow, especially if this is your first weapon assembly. A good tip is to also have a spare parts kit around in case you bend or lose a part.